Natural Beef Tails are the perfect long lasting dog chew – they’re simply dried beef tails containing no artificial additives or preservatives. These are one of our best selling chews and will keep your dog entertained for hours! In the 250g packet you will receive approximately 5 – 7 tails. 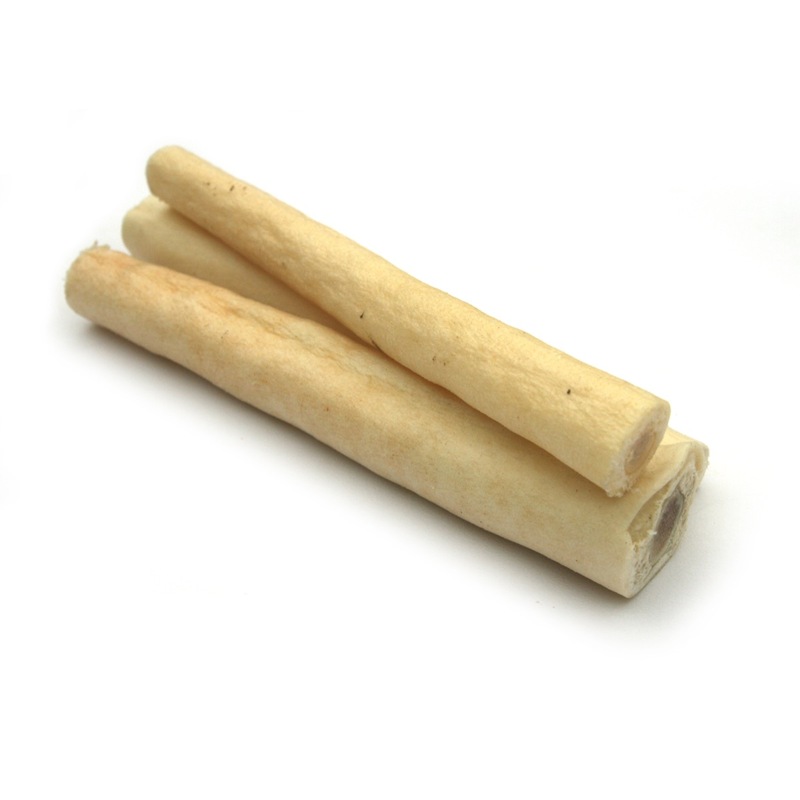 JR’s beef tails for dogs are one of our most popular natural dog chews. 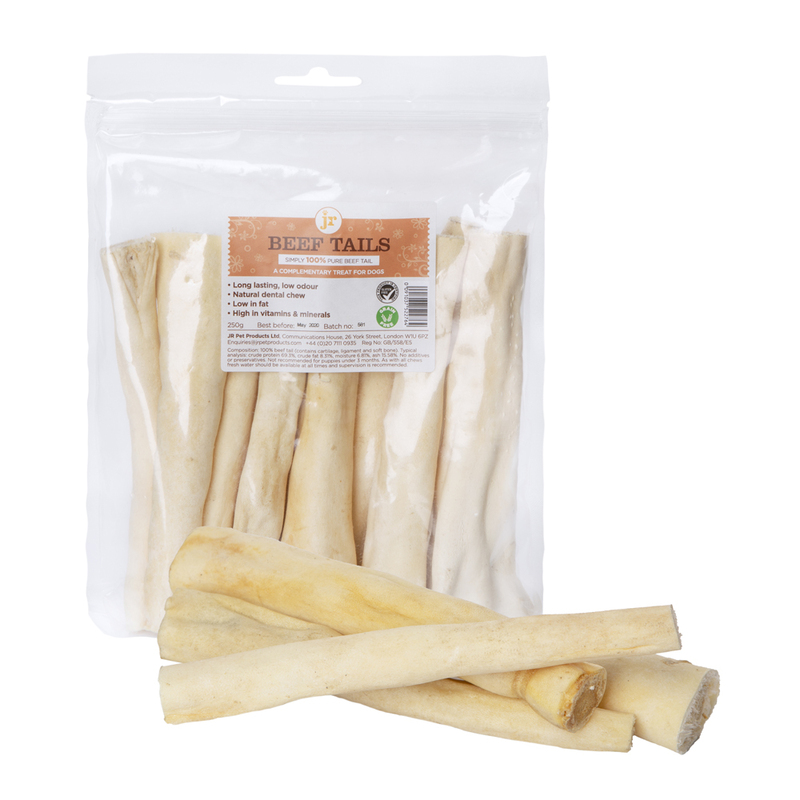 Naturally long-lasting, crunchy and chewy from the natural cartilage, they are perfect for cleaning your dogs teeth and gums. Read more about Dog Treats. Are Beef Tails for dogs Grain & Gluten free? Yes! They’re totally grain and gluten free. Gluten may be a problematic ingredient for many dogs, and can cause problems like gastro-intestinal upset similar to that seen in humans. It can also mean itchy skin and ear infections. Grain is also a primary contributor to the growing obesity and allergy problems in dogs. Our canine friends are designed by nature to eat protein from meat sources. What ingredients do Beef Tails for Dogs contain? JR believes that keeping it simple is the best thing for your dog. That’s why our Beef tails contain only one ingredient… Beef tail! thats it. These tails come in a 250g packet and contain approximately 5-7 tails. The tails very in thickness as you would expect due to them being completely natural. As with all chews for dogs we recommend to supervise your dog while feeding and to ensure that fresh clean drinking water is always available. Crude protein 69.3%, crude fat 8.31%, moisture 6.81%, ash 15.58%. Brilliant. Keeps the dog entertained for hours, is healthy and doesn’t splinter.